William Cavendish, 1st duke of Newcastle was born c. 1592 or 3. 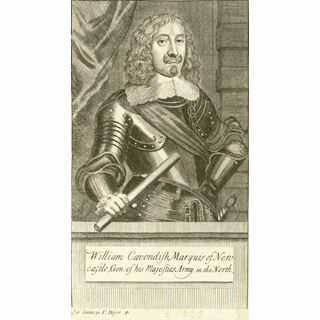 He was also called (from 1620) viscount Mansfield, Baron Ogle Of Bothal, and (from 1628) Earl Of Newcastle-on-Tyne, Baron Cavendish Of Bolsover, and (from 1643) Marquess Of Newcastle-on-Tyne. The son of Sir Charles Cavendish, he attended St. John's College, Cambridge, and through inheritances and royal favour became immensely wealthy. 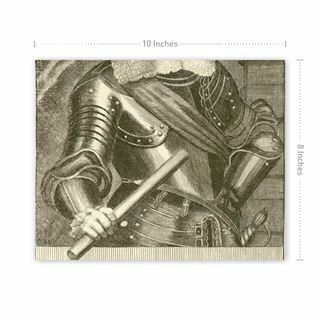 He supported King Charles I against Cromwell and his supporters in parliament. He was held in high esteem by the Stuarts, James I and above all Charles I (d. 1649), who entrusted him with the education of the Prince of Wales, the future Charles II. Newcastle served his sovereigns loyally, raising at his own expense a corps of volunteer horsemen, close to 10000 pounds, for Charles I who had neither money nor troops. He supported the famous prince Rupert out of his own pocket during the first years of the civil war. 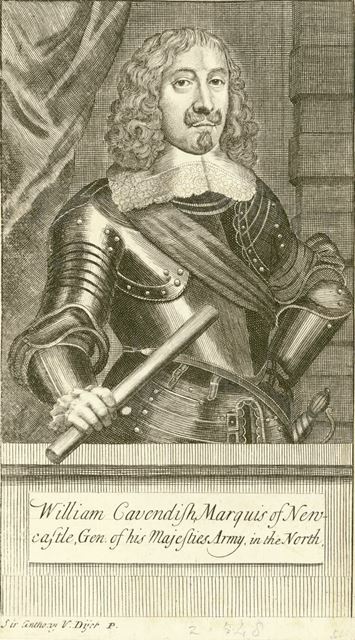 After the defeat in the battle of Marston Moor (2 July 1644), cut off from the royal army, he sailed from Scarborough to Rotterdam where he rejoined the Prince of Wales, his former student, and went to Paris (1645), where he married his second wife, a maid of honour of Queen Henrietta of England (see image DCHQ200235). He established himself in Antwerpes, where he recovered a part of his fortune and built a manege, to indulge his love of horses, which quickly became famous. After the restoration of Charles II he was permitted to return to his native country. Newcastle spent a total sum of around a million guineas for the cause of the Stuarts. 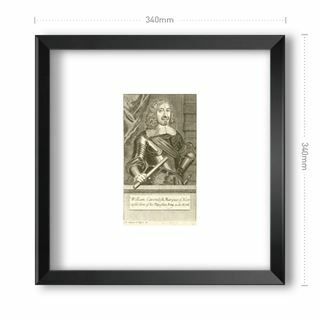 He was recompensed by Charles II who made him a duke in 1665, governor of the town of Newcastle, and chief justice of the counties north of Trent. He then divided his time between his castles at Welbeck and Bolsover. He taught his two sons and three sons-in-law in haute ecole, and established a hippodrome-riding hall at Welbeck and Bolsover. He was also a man of literature. He wrote several comedies, translated L'Etourdi by Moliere and sponsored Dryden, Ben Johnson, Hobbes, Descartes, and Gassendi. 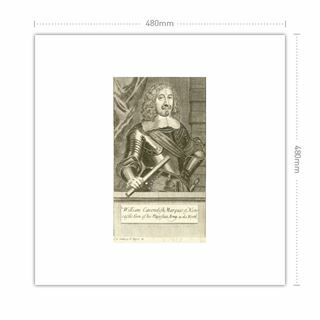 He died at Welbeck on Christmas day 1676 and was buried at Westminster. This image is one of a collection by the famous local antiquarian, Thomas Bateman, of Middleton by Youlgreave. (1821-1861). Bateman organized his collection by inserting them into a 4 volume copy of Lysons Magna Britannia, Derbyshire, creating a fascinating and unique illustrated record of the county. The purchase of the collection for Derbyshire Libraries was made possible by the generous bequest of Miss Frances Webb of Whaley Bridge, well known local historian, who died in December 2006.